I’ve been drooling over Sniper Bladeworks custom knives for a long time now. For the uninitiated, Sniper Bladeworks is the brainchild of Lance Abernathy and Jody Muller. Jody handles fabrication and Lance comes up with the designs. The result has been a number of award winning tactical knife designs and superbly built tools that are revered by collectors and users alike. The Boker S2 is Sniper Bladeworks’ first collaboration with a production company. I recently got my hands on one of these knives and was really impressed by how well the knife worked and the level of fit and finish. The intriguing design lead me to contacting Lance himself in order to gain some insight on this unique knife. Lance was able to provide some of the details and explain why the S2 was built the way it was. It was a real pleasure speaking with Lance, and I hope our conversation helps provide a better review. It should be no surprise that Sniper Bladeworks focuses on tactical knives. Lance comes from a heavy law enforcement background and served on a SWAT team for over 11 years. The Sniper Bladeworks custom knives are all built with utility, ergonomics and aesthetics in mind. The S2 is no different. This is a big knife so I would put it in the tactical and/or utility role. I think it’s big for EDC, but it doesn’t look that threatening so it could be a good choice if you like to carry a bigger knife. The S2 has an overall length of 8-3/4″, a 4″ blade, weighs 5 ounces, and is made in China. This is not a small knife. By way of comparison, I find it holds it’s own next to a Spyderco Military (which also has a 4″ blade, but has a total length of 9 1/2″). The blade is a big piece of 440C stainless steel. Boker uses a lot of 440C in their plus line and I welcome it with open arms. It’s a good mid-range steel and an all around performer. The width of the blade is impressive and it has a large flat grind that begins almost at the top of the knife. The long curved spine drops off into a nice functional tip. This tip isn’t reinforced and the overall bladeshape is faintly reminiscent of a sheepsfoot shape. Naturally there is a lot of utility with this blade for day to day tasks. I also think this could possibly serve as a rescue knife. And naturally I think the knife could also be used as an emergency defensive tool too. The excellent slicing capabilities of the flat grind mean you could use this knife for anything from cutting seatbelts to preparing food. Finally, I wanted to comment on the stone wash Boker applied to this blade and hardware. It’s a rough and tumble stonewash and it has created a nice effect. Between the design and finishes of this knife, I get a really utilitarian vibe, and this knife just begs to be used. The handle is one of the most interesting aspects of the S2. It’s construction is simple enough, with black G10 over matte gray steel liners. The liners have been milled to reduce weight and a black G10 backspacer runs a little over half the length of the handle. All in all, construction is good and all the pieces line up flush with no gaps or irregularities. Ergonomics on the S2 are pretty special, and it’s where the knife really starts to shine. At first glance the handle is boxy looking and doesn’t appear to be that comfortable. I’ve heard some go so far to say that the handle is “ugly” – I disagree, but to each his own. I’ll say it’s a somewhat unconventional shape, but it really works in your hand. First off, it’s a pistol grip, meaning that the handle attaches to the blade at an angle and naturally orients the blade towards the cutting surface. Lance told me they like this style of handle because it puts the tip on target without bending the hand. In my experience, this design totally works. The flat back of the handle fits the palm perfectly and your thumb falls into a nicely jimped thumb ramp. When I first picked up the knife I felt like this was a blade I could get some work done with. The flipper also acts and integral guard/choil so your whole hand wraps around the knife nicely. It’s a clever design and the guys at Sniper Bladeworks made the handle plenty big so you have lots of room to move and use various grips. As a final touch there are some grooves milled into one side of the handle. This provides some extra grip to the already nicely textured G10 and adds some visual interest as well. Lance told me that they like designing knives that look good open and closed – the lines to add a little something extra. The S2 actually ships with 2 pocket clips, for tip up or tip down carry. Its a good size clip that rides low in the pocket. Retention is good and I found it to be easy to insert into my pocket. Unfortunately the handle has been drilled for right hand carry only. The S2 is deployed by a large flipper on the back of the handle. This knife quickly broke in and I find that deploying this big blade is effortless. I think a flipper was a good idea for this wide blade because your thumb would have to travel far to fully activate a thumb stud. No complaints with the deployment of this knife. Lockup is achieved through a liner lock. This is a pretty thick liner lock and it engages early with a crisp snapping sound. I found it to be easy to disengage, but because the handle isn’t cut away it does take a little more effort than other knives with a cutout for your thumb. I think for most tasks the liner lock will be more than adequate. All in all I am very pleased with my S2. To be honest, I can’t find a major fault with the knife (the lack of an ambidextrous pocket clip would be my biggest complaint). I think Boker was smart to pick up this cool design from Sniper Bladeworks. When I spoke with Lance he said that they wanted to create something big and functional – just like one of their custom pieces. I think Boker executed that concept wonderfully, as the fit and finish is very high on this knife, with the country of origin being China. When you consider that the S2 can be acquired for around under $50, it’s tough to ignore the great value here. I won’t be able to afford a custom anytime soon so this is the closest I will be getting to a real Sniper Bladeworks knife for a while. Great review! 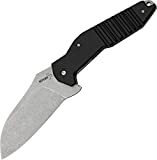 I have been hoping that you would do some of the newer Boker Plus knives. I really like tall flat ground blades. I could see this one with a nice beefy frame lock. Thanks Matt. I need to get some more Boker reviews done. Hopefully this will be a sign of stuff to come. A frame lock would be excellent with this knife creating a more hard use folder. Always good to see more Boker reviews. I think they’re under represented. I think this will continue until they get some big box store shelf space. I have 2 Bokers that are very nice knives. This looks like a solid EDC choice. The beefy belly and the style of pocket clip remind me of the skyline. I have to wonder if it’s as good a cutter. I bet it is. I’d love to feel the grip on that sucker. Absolutely man – I totally agree. I will endeavor to get some more Boker reviews up. This is a pretty solid EDC choice, big, but solid. Hopefully you will be able to get your hands on one at some point. Hell, does anyone note that the glass breaker works or is carbide? Seems that is a major point. Almost no one mentions the glass breaker except that it has one. In the lake is NOT the time to find out. Kershaw DOES tell a buyer; theirs IS carbide. I don’t even think the review stated this. I do not think there is a glass breaker on this knife. At least there wasn’t one with the version I received. I’d like to get one of these. I wasn’t aware that there was a SBW Boker collaboration. Looks like a great buy. I saw the Boker ad for this in Tactical Knives or Knives Illustrated recently. I think I will pick one up because of this review. Great job on the pictures too. Thanks, Greg. I am pretty sure you will like this one. I know a couple other people who purchased it and they were happy with the knife. Yes, I got it and it is great! I can’t believe that I didn’t notice it in the Boker 2011 catalog. Because of this I am looking into other knives in the Boker Plus line. Fit and finish is good. The blade wasn’t as sharp as most other brands are new out of the box though — I took care of that easily enough. This is my first knife with a blade of 440C steel. The modified Wharncliffe blade shape is one of the best utility shapes I have ever used. I will be looking for more of them for sure! The handle ergonomics are great and so is the blade-to-handle ratio — it can be tricky to fit such a large blade into a folder without it being too big of a handle. I bought one of these from trusted vendor. The knife arrived with a huge smear in the G10. Smear is the only way i can describe it. It looks as though something hot was on the G10 and melted a portion of it smooth. I returned it. The replacement was ok for about the 1st month. Now the liner lock goes all the way to the other liner and the lock is VERY difficult to disengage. 🙁 I am really bummed because i like this knife. Now i have to send it away to Boker warranty service and hope i dont get something worse in return. Ah, JD I am sorry to hear that man! Mine was pretty solid, so hopefully they will send ya a good one. My understanding is their warranty service is pretty good. Revisiting this review to ping for some feedback. The S2 that i mentioned above did go back to Boker. They sent me a new knife in return. One thing i noticed with my very first S2 (the one i mentioned above with the smear in the G10) was the the blade was not centered. While folded It was fairly tilted towards the locking liner. When i received a replacement from the vendor that unit too rested towards the locking liner. Now that i have received a replacement from Boker, this 3rd unit also leans towards the locking liner. Any pivot adjustments made do not seem to help. When it is adjusted so the blade is centered, it is very lose when locked up. Any attempt to tighten the pivot result in blade movement toward the locking liner. The tighter the pivot the more it will move towards the liner. Has any one else experienced this? Sorry to hear that man. My example was well centered so there isn’t much I can say. With any luck others will chime in with their experiences. Sam, my guess would be around 40 degrees inclusive. In all likelihood the edge has been hand ground so you may see some slight differences in geometry from knife to knife.